This wheelchair / scooter bag has been designed to provide a useful holdall and to allow two crutches or walking sticks to be carried on the rear of a scooter or wheelchair. Inner pouches keep the crutches or walking sticks totally away from other contents of the bag. The bag also has a pouch at the front for smaller items. 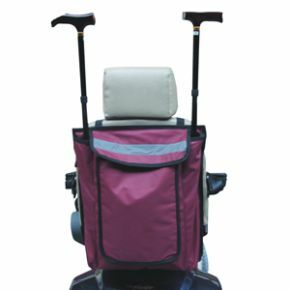 Supplied with both handle loops and adjustable straps to ensure that it fits virtually any wheelchair or scooter. Size.............405 x 485 x 75mm (16 x 19 x 3").